All the very latest, best and and even award winning travel cots - we have mattesses to fit them. All of the latest models including the BabyBjorn - odd sizes of mattresses for children's and baby cots are our speciality. We make any size or shape of crib or baby mattress or pad and we ship worldwide at very favourable shipping prices. Travel cots are portable cots you can fold up and put in a bag to take away with you. Most have a plastic or metal frame, woven fabric-and-mesh sides, and a hard segmented bottom with a folding, lightly padded mattress. Do you really need a travel cot? You really only need a baby travel cot if you’ll be making regular overnight trips to cot-free homes. Even then, if your baby is likely to stay somewhere overnight on a regular basis (say, with grandparents), it’s worth considering buying a cheap, standard cot instead to keep at their house. If you plan to stay at a hotel or holiday home, many will provide a cot or at least will be able to arrange hiring one for you. 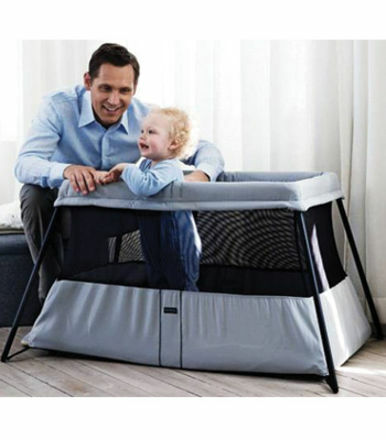 If you have a network of friends with young children, borrowing a travel cot for occasional use shouldn’t be too hard. Ensure how you will use it - as a main bed, at weekends, for just one holiday or at Grandma's every weekend. Check out our mattresses for travel cots.